High-molecular-weight “relic” DNA fraction can be electrophoretically separated from the bulk of barley DNA digested with different restriction enzymes. We have cloned and analyzed a population of relic DNA fragments. The majority of AluI-relic DNA clones contained barley simple sequence satellite DNA and other families of repetitive DNA. One of these families, designated HvRT, has been analyzed in detail. This family is composed of tandemly arranged 118-bp monomers and is present in 7 × 105 copies in the barley genome. Clones representing the HvRT family were sequenced. HvRT repeats were found to contain high levels of methylated cytosine. 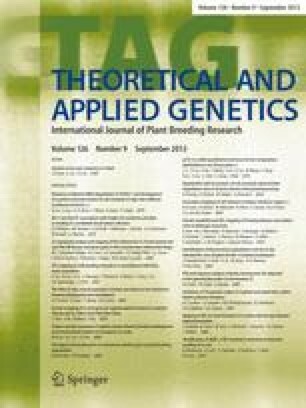 The HvRT family was found in the genomes of H. vulgare, H. leporinum, H. murinum, H. jubatum, but not in H. marinum, H. geniculatum, and wheat. Different barley species and cultivars show restriction fragment length polymorphism with the HvRT probe. Chromosome-specific subfamilies of HvRT were found to be present on different barley chromosomes, providing the possibility of using the HvRT probe as a chromosome specific marker. HvRT fragments up to 810 kbp in length were resolved by pulsed field gel electrophoresis.